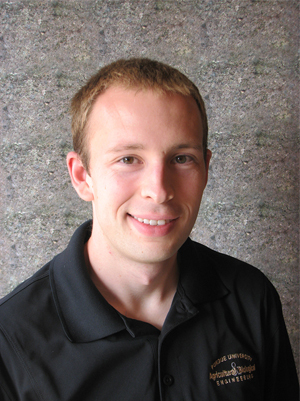 Mike Sprengel has joined the Czero team from the Maha Fluid Power Research Center at Purdue University, the leading fluid power research program in the U.S., where he was a Department of Energy H3CoE Fellow. Mike brings special expertise in new hydraulic hybrid architectures, supervisory control schemes, and energy efficient on-road and off-highway vehicles. His role at Czero includes advanced algorithm development, simulation, modeling and hardware-in-the-loop (HIL) testing, a technique for efficiently testing the physical hardware and controls of an embedded system by simulating some or all of the systems with which it interacts. Mike’s engineering work has included using neural networks to develop optimal, often non-linear control methodologies. An example of how this works would be training an intelligent control system on generalized trends between velocity and optimal machine state; in the field, that control system could then use a brief history of machine data to adjust the system for better performance in the present operating conditions. Mike’s experience applying neural networks to mechanical engineering challenges will have particular value in Czero’s work optimizing the power and energy efficiency of complex machines. Making a significant new contribution to powertrain technology, Mike proposed and developed a novel hydraulic hybrid powertrain architecture that in testing surpassed the fuel efficiency of both baseline mechanical and conventional hydraulic hybrid transmissions. Called a blended hydraulic hybrid, the system combines a hydrostatic transmission, a parallel hybrid, and a selectively connectable high-pressure accumulator. This configuration merges the responsive nature of a hydrostatic transmission with the energy-saving potential of a hydraulic hybrid, while allowing efficient operation under a wide range of conditions. Mike’s research team investigated the blended hybrid architecture using a variety of techniques, among them using dynamic programming to compare the energetics of the blended hybrid with various powertrain architectures, an approach that eliminated the controller’s influence on fuel efficiency thereby ensuring a fair comparison. To further explore the architecture, the team constructed a blended hybrid on a dynamic hardware-in-the-loop transmission dynamometer and evaluated system performance over a range of drive cycles. In order to prevent differences in driver experience from potentially hindering adoption of this new technology, a significant part of Mike’s research involved developing and testing control strategies to replicate the feel of a conventional on-road vehicle with the blended hybrid architecture. The team then validated and showcased the concept by converting an SUV into a full-scale blended hybrid demonstration vehicle. Regarding his new role at Czero, Mike says he looks forward to the diversity of R&D projects Czero undertakes in advancing energy-sector and automotive technologies. He sees an especially big opportunity to improve off-highway vehicles, such as those used in agriculture, construction, transloading and mining.